I don’t question the expertise of cb4tb, but what concerns me more is the continuing denials for the sake of PR and how they embolden trolls to attack shipper blogs. It appears to me no one in PR has any regard for the toll it takes on shippers. IMO it is cruel and beyond manipulative to pit one section of the fandom against another. Starz PR is slimy at best IMO. The principals compliance in such a tactic bothers me no end. Call me naive IDC. Awww…I hear what you’re saying. I really do. I’m sick to death of it too. So sick that I can’t even work up any enthusiasm for the new season. How sad is that!? And judging by the body language and the fact that she slipped past those fans outside of Kimmel, I think Cait hates it too. I like that you use the word ‘compliance’ when I’ve seen so many accuse her of ‘conspiring’. There’s a huge difference. Yes, Cait, and Sam too, are complying…with the wishes of their employer, with the small print of their contracts, with something that we aren’t privy to but have to accept, like it or not, and while serial denials is a most annoying form of PR, the trolls don’t need it. 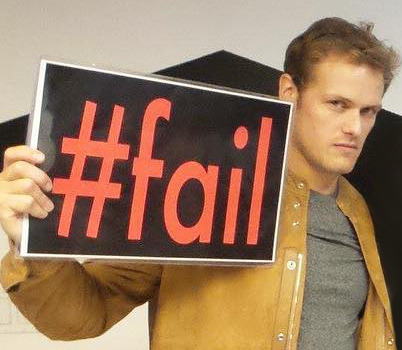 They’ve been emboldened to attack our blogs by lesser things…by Sam’s forehead in Paris, by every time we laughed at Sam and his Blonde Of The Week’s attempts at looking coupley…this promo is just the latest thing. In fact, the bigger the receipt the louder they rage, so based on the number of angry anons lately, I’d say they see what we see but don’t dare say so. I will agree with you that Starz PR is slimy. These are some low moves. But I posted a while ago about how the studio and the stars see fandom. It’s all demographics to them and you really must not take it personally. They aren’t pitting one side against the other because they don’t like me or you or anyone in particular in the fandom. We aren’t each represented by a different coloured push pin on a corkboard in Chris Parnell’s office. For some reason that makes sense to someone important, they are determined to push the fact that the two leads of this show are not a couple in real life. They are actors and she is engaged to Someone Else. The group they’re targeting with this will read that or see it somewhere along their way to Episode 1 and believe it. Some, like us, won’t. Some will be offended. Some will walk away. Some will continue to ship. When the dust settles, more viewers is the goal. Try to remember too that this all took place between the time of the Australia Unplugged Tour and mid March. For all we know they aren’t paying much attention to it right now. That would be a good idea, for the sake of their own sanity. Cait didn’t have a giggle over breakfast with LR and Chris Parnell about the Parade article and then head off to make googley eyes at Sam at their next promo, whatever that was, then answer KDS in the “so you’re engaged, have you ever lusted after a costar?” game before sitting cuddled up beside Sam at NYCC, then whip off another issue of I’m Engaged last night before pasting an order of fries over his giant shrimp, then getting up this morning to do another impromptu interview announcing her engagement and dissing the 0.1% of fans who can’t be happy for her. That would be mean. These denials happened all on the same day and within a week of Sam having to fly to LA for one last red carpet date. I can almost picture Cait feeling determined, if not ecstatic, about pulling these off, knowing that he was home, Skipper’s contract was coming due, and this announcement of hers was going in the files to be their cover. I agree with those who’ve said that they don’t think going in she ever meant for it to be used as the main thrust of Season 4 promo. I bet they drank a lot of celebratory whisky that last week of March after a hellish stretch at work, and it feels like the celebrations continue. They’ve both been bolder and a little more rebellious ever since. Oh, and yes…never question the expertise of @cb4tb The lady knows her marketing and has dumbed things down for me more than once. It’s like ET Canada completed its obligation of posting the engagement question but did it in a way that wasn’t on their website and wasn’t promoted. And used shippers as their spin channel. I thought it was included in the tweet that I skimmed past this morning. That alone should tell you this is all a game. Let me see if I have this straight: a portion of a months-old interview with CB, wherein the “engagement” is discussed, is posted, but no attention drawn to it and it’s difficult to find; however, it’s dropped into multiple shippers’ in-boxes, where the predictable outrage ensues about what a liar CB is. Whose purpose does this serve? Whose agenda? Surely not CB’s. Of course it serves her purpose and that of the show. It reinforces the interests to those who ignore receipts like someone with their fingers in their ears saying lalala, I can’t hear you. I mean we’re only 0.1% of the Fandom right? Then again what she said about people who can’t be happy for her fits exactly the antis, ABC and those who fear the show will be ruined by them being together. Who are the smart people behind Caitriona’s narrative? who is giving the approval to interviews where she talks about the fakengagement released AFTER 7 MONTHS against ask to cut those parts? do you know how bad she looks when she posts a pic of Sam with a french fries emoticon on his c0ck (positioned sliding her finger on his body) and hearts coming out his pocket, when she licks the same spoon that Sam previosly used and he put back in his mouth after like it’s the most natural thing in the world to do and then you let release these denial engagement talk combo? do you understand that the only image you are giving is that Caitriona is cheating her fiancé with Sam? you really want to destroy her personal image? let her lose her most supportive fans? It is particularly dangerous because if she does marry Mr. McGill, not only will she have messed up her own public persona, she will make her lovely co-star look like one of the biggest jerks around. He is not a jerk. He is a kind, loving, generous man and none of this contradicting narrative honors him or the magical performances they give together. She certainly doesn’t honor herself and neither does he really. Even if it turns out this was dictated by the studio, it is long past the time when they should have said no together. There may be another reason this all came about. Security. I know Sam gets stalked and Caitriona gets death threats. Perhaps, they are both protecting something very precious to them. We live in a world where the truth doesn’t matter, people get killed going to temple, pipe bombs get delivered to all the leaders of the opposition political party, and the Army is sent to the border with guns they can’t shoot Constitutionally to protect us against some desperate people fleeing violence. So — Sam and Cait are not really that important and the fact that so many totally rational women still care what happens to them is a miracle in itself.